What Constitutes a Complete Experience? 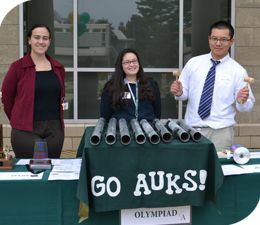 A well-rounded education includes a balanced program of extracurricular activities, and Archmere offers a wide variety of activities from athletics to theater and many clubs in between. Today’s colleges seek students who show a dedication over their four years to an activity or sport, demonstrating a commitment through quality time to a particular activity, rather then creating a laundry list of superficial involvements. 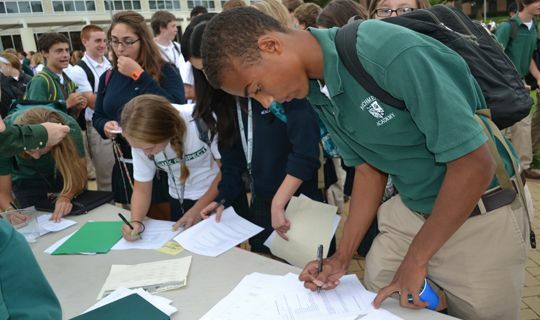 Archmere offers a variety of extracurricular activities with different commitment levels. Some activities such as an athletic team or Class Office call for full time attention, limiting other possibilities. Other activities such as Fencing, High School Bowl or one of the many agencies of the Community Service Club enable a student to handle two or three activities at once. While Archmere encourages students to involve themselves in some extracurricular activity, we do caution them to avoid overextending themselves. Whether you continue nurturing a talent you've been developing for years, or decide to try something new and discover a passion of yours, what's most important is that students take advantage of the long list of opportunities found in the box on the right hand side of the page. Get involved! Archmere’s National Honor Society officers self-manage important projects at Archmere, like the Peer Tutoring Program, the Clothing Drive, and the Adopt-a-Family Program. Our students take on real-world responsibility for service oriented work that instills the values of community and respect for others. The SNHS was chartered to encourage and recognize scientific and intellectual thought, advance the student's knowledge of classical and modern science, encourage a dedication to the pursuit of scientific knowledge that benefits all of mankind, and to encourage students to pursue the study of science, engineering, and math in college. Criteria for membership are rigorous. Students must take science classes all 8 semesters. A student must have taken Honors Biology, Honors Chemistry, and Honors Physics or the AP equivalent. Each semester grade of freshman, sophomore, and junior years and the first semester and third quarter grades in senior year must be at least a B+ or a B if it is an AP course. We offer our students the opportunity to join the National Art Honor Society by invitation. The goal of the Archmere Chapter is to inspire and recognize students who have shown outstanding ability in the visual arts. NAHS strives to encourage its members to work toward attainment of the highest standards in visual arts, and to bring art education to the attention of the school and the community. Our main focus this year is to provide community service to different organizations in the area with workshops for the homeless, urban playground designs, and fundraising. Sponsored by the American Association of Teachers of French, the Societé Honoraire de Francais was established in 1976 and honors those students who not only have excelled in the study of French, but who have demonstrated a strong commitment to academic achievement in all other subjects. Members are selected the first semester of French III and must have an A average in French, an A for the semester of selection, and a minimum of a B average in all other courses. Delta Epsilon Phi (ΔΕΦ) Deutsche Ehrenverbindung for High School Students of German recognizes the outstanding academic achievement of learners of German. The organization was founded to reward scholastic achievement in the study of German and to promote interest in the study of German language, literature, and civilization. The Archmere chapter was formed in 1977. To be eligible for induction, students must have completed either five semesters of German after entering as a Freshman in level one, or three semesters of German after entering as a Freshman in level two with an overall grade point average of 3.0 and at least a 3.5 grade point average in German. Students who begin their study in Spanish II as a first year student, earning a B+ in 3 semesters of Spanish with no Spanish grades lower than B+, or students who began in Spanish 1 as a first year student, earning a B+ in 5 semesters of Spanish with no Spanish grades lower than B+. Any transfer students must have a B+ in 3 semesters or more of Spanish with no Spanish grades lower than B+. Los Hidalgos Chapter was established in 1966.